Special education classroom assistants, bus aides, security officers and custodians in Chicago Public Schools are concerned about staffing levels, the evaluation process and their wages. 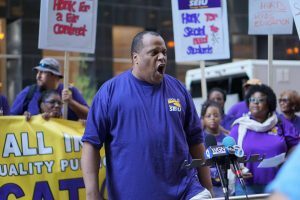 Members of Service Employees International Union Local 73 sent a message both inside and outside Chicago Public Schools headquarters on Aug. 22. Union members packed the CPS Board Room during a brief presentation during public comments, but not before first demonstrating outside CPS offices. 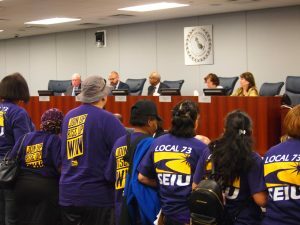 SEIU Local 73 members said that staffing cuts, the outsourcing of services and an unfair evaluation process have left the CPS workers feeling ignored and disrespected. “We are here because we need Chicago Public Schools to respect the work we do,” Susana Ibanez, a special education classroom assistant at Barry Elementary School on the city’s Northwest Side, said during a rally before the School Board meeting. Dozens of Local 73 members locked arms during the board meeting, saying the board has to understand the importance of current negotiations. After union leaders called on people with answers to be sent to the negotiating table to avoid contract negotiations dragging out needless, union members chanted “We’ll be back” and “Together we rise” as they left the Board Room. The union members said that they want to see movement in the contract negotiations. They said that placements at 140 school properties are on the table currently. “We expect reasonable requests and compromise,” said Dian Palmer, co-trustee of Local 73. Union members argue that additional cuts to special ed and bus assistants, custodians and security personnel would under-serve the city’s public schools. Jesse Sharkey, vice president of the Chicago Teachers Union, said that teachers are in solidarity with Local 73 members in their contract negotiations with the school system. He said CPS would be under-serving schools by not providing adequate numbers of custodians, special ed and bus assistants, and security personnel. Like the Local 73 members, teachers “want to be included and negotiated with in good faith,” Sharkey said. He said teachers want to be given reports on the cleanliness of schools and policy changes like the recently adopted cell-phone and social-media policies for staff and students. CPS CEO Janice Jackson said that information on the cell-phone and social-media policy changes was sent to CTU leadership prior to the School Board meeting. 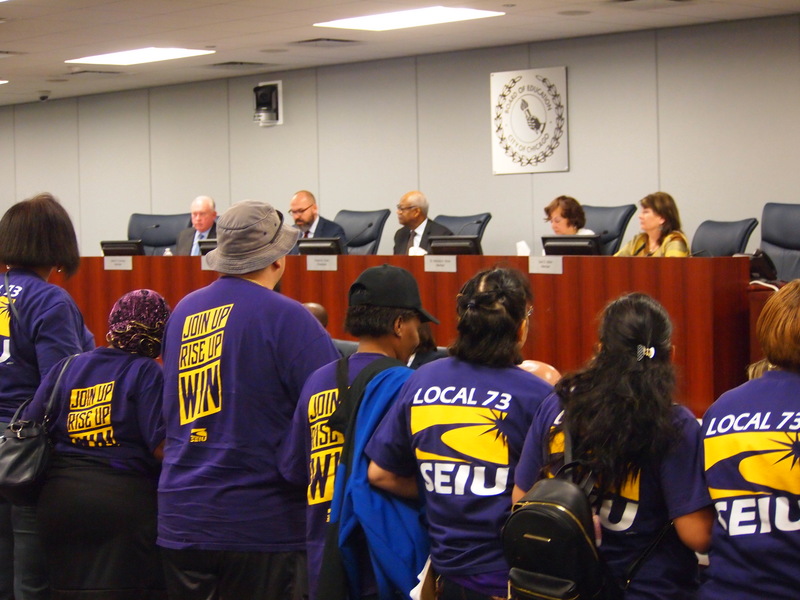 The contract battle is just the latest squaring off of CPS and SEIU Local 73. Earlier this summer, several members of the union faced layoffs, but union leaders were able to keep members’ jobs. SEIU’s next Contract Action Team meeting, where details of negotiations are shared, is scheduled for Sept. 12. Get your free subscription of the Cook County digital edition. Tagged with: chicago Chicago Public Schools chronicle media Chronicleillinois.com chroniclemedia.com Cook County Cook County Chronicle cookchronicle.com CPS Illinois Labor SEIU Local 73.